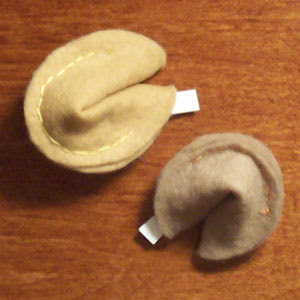 A while ago, I found this easy tutorial on how to make felt fortune cookies. I'd been waiting to find time to sit down and make a few. Recently, I had a friend who could use some good fortune, so I decided she would get my first felt fortune cookie experiment! Making the fortune cookies was really simple. The tutorial suggests machine sewing, but I opted to sew by hand, and I think the result is just as good. I also altered the pattern slightly, but you will notice once you begin that there are probably several ways to achieve this final product. I used tan felt with a slightly contrasting yellow thread. The fun part is writing the fortune and giving it away! Next time around, I might experiment with different color felts, fabrics, and sizes.